If you are a fan of the legendary Ray Bradbury and will be in the Los Angeles area on Sept. 19, you’ll want to take advantage of the opportunity to meet the man himself. 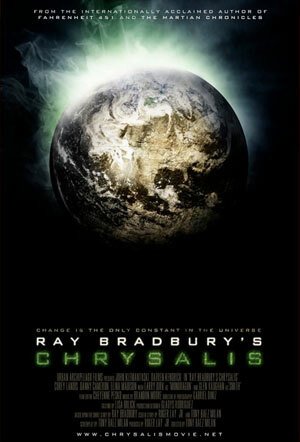 Bradbury will be appearing at the Los Angeles Comic Book and Science Fiction Convention from 12pm to 2pm to sign copies of the just released DVD, Ray Bradbury’s Chrysalis. Bradbury’s writing has inspired generation after generation of writers with his iconic works such as Fahrenheit 451, The Martian Chronicles, Something Wicked this Way Comes, The Illustrated Man, Dandelion Wine and many others. In fact, I chose him when, in High School, I had to select an American Author to write six papers on. Several of Bradbury’s stories have been adapted for film and television. 27 of his stories were adapted for the classic EC Comic Books of the 1950s in such titles as Tales from the Crypt, Vault of Horror, Haunt of Fear, Crime Suspenstories, Shock Suspenstories, Weird Science-Fantasy, Weird Science, and Weird Fantasy. He just turned 90 years old in 2010 and is still active and involved with creating new works. Back when I was writing those papers, he only had five novels and I had to select a few short stories for my final paper. But these days, he has several more novels out. Ray Bradbury’s Chrysalis is based on one of his short stories. Appearing with Ray for the signing will be Cast Members Glen Vaughan, Corey Landis (Dinocroc vs. Supergator), Elina Madison (Creepshow III), Darren Kendrick, Larry Dirk, Producer Roger Lay, Jr. (Ackerman on Bradbury), Composer Brandon Moore, and Creature Effects Designer Lee Romaire (Van Helsing – makeup, War of the Worlds – animal effects). The DVD, Poster, and CD will be available for purchase at the Convention. Does Genre Literature Affect the Teen Brain? I bet you would love to be there by then! Did you know that his book “Fahrenheit 451” had been banned in some schools and libraries because of it being “socially offensive”? Evidently, only a sanitized edition was sold from 1973 to 1979 and WITHOUT asking or telling him! I learned this from the Sept. AARP bulletin this month.